When was the last time you took time to rest and relax in a space designed for your comfort, enjoyed a couple of hours of soothing services that calm your mind, rejuvenate your body and uplift your mood? Life gets so hectic that very often it’s hard to find the time to relax. But it’s important to unwind and de-stress, and what better way to do it than by visiting a spa. Whether you need a personalised body massage to shake off your stress, a hydrating and nourishing facial to reclaim your skin health and give it a beautiful boost, or want to refine your silhouette with a body sculpting wrap, ShuiQi Spa has a treatment for every wellness-seeker and a place where you can enjoy some proper ‘me time’. Synonymous with holistic wellbeing, ShuiQi Spa in Dubai is all about you. 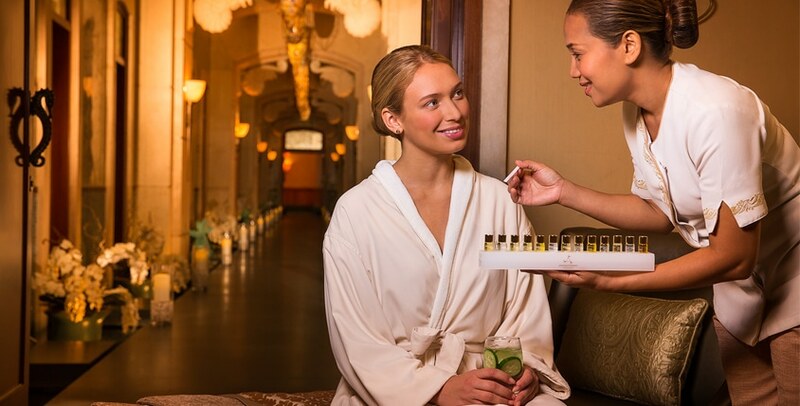 Select treatments that reset the balance between your body and mind, while addressing your needs and desires. Our team of therapists and estheticians care about your well-being and will assist you in creating the perfect spa day experience. Prepare to indulge and relax. 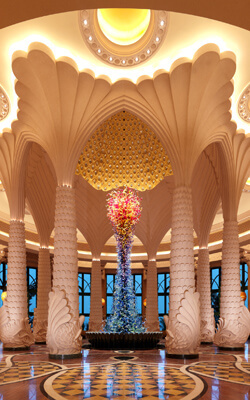 A visit to Atlantis, The Palm without a session at ShuiQi Spa would be sacrilege. Spanning two magnificent floors within the unique settings of West wing of The Royal Towers of Atlantis, ShuiQi Spa is a haven for pure relaxation where you can indulge in luxurious spa treatments. The term ‘Shui Qi’ translates as ‘water energy’, and all our spa treatments concentrate on using water to induce deep relaxation and harmonize an individual’s inner balance with the surrounding environment. ShuiQi Spa combines inner harmony, wellbeing and aesthetic beauty with exclusive spa treatments and products from well-known international brands such as ESPA, Shiseido and Aromatherapy Associates. Inner wellbeing, spa and fitness are the three cornerstones of holistic wellness, which lies at the heart of ShuiQi. Each of its luxurious 27 treatment rooms is designed with modern aesthetics to combine invigorating experiences with truly exquisite style, offering a range of exclusive treatments and traditional therapies that promote your wellbeing. 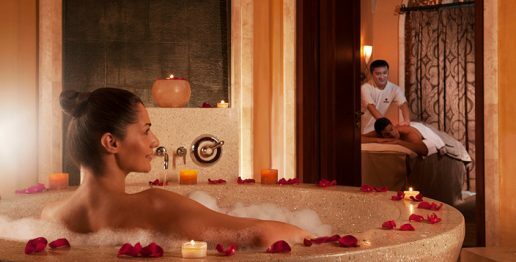 Experience tranquility and lose yourself in the privacy of ShuiQi’s `Royal Spa Suite´, our absolute most popular spa suite designed only for couples. The exclusive Shiseido Japanese Couple’s Ritual focuses on balancing ‘Qi’, vital energy of the natural world, that is central to traditional Chinese medicine, by stimulating certain pressure points in the body and inducing relaxation. The signature treatment begins with an infused rose petal foot bath and a Japanese inspired body bath. The ritual continues over the course of four hours with a full body Qi massage, scalp massage and Shiseido’s premium facial, ‘Future Solution LX Facial Ceremony’ for her, and the ‘Time Fighting Facial’ for him followed by an elegant Sushi selection. Included within this package, is a delicate refreshment of Japanese Green Tea. The perfect spa experience for you and your partner commences with Kuroho Body Bliss, a full body exfoliation and replenishment treatment – inspired by the relaxing effects of traditional Japanese fragrance Kuroho and its ingredients – that deeply exfoliates, cleanses and leaves your body feeling luxuriously smooth. 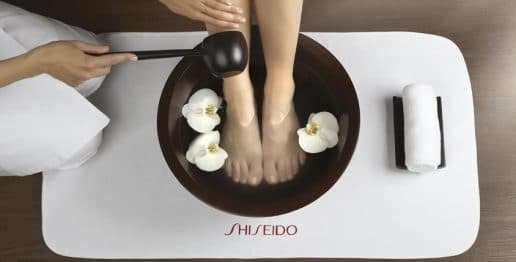 This is followed by a blissful Qi body massage, which involves the application of Shiseido’s replenishing body cream, and a specialised facial. A highly recommended spa experience. 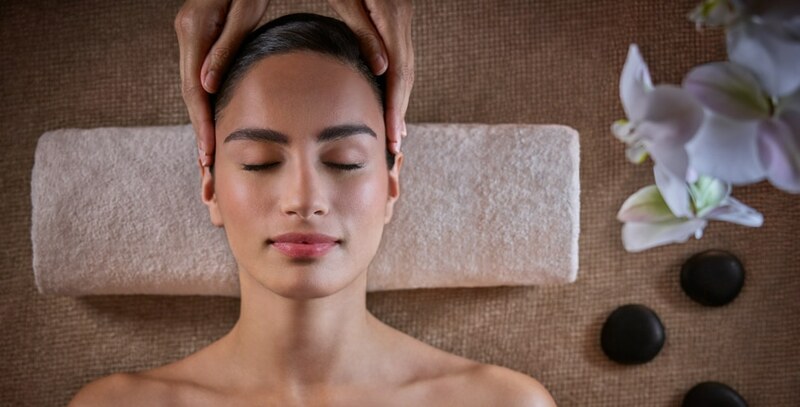 Designed to leave you feeling relaxed and restored, ESPA Back, Face, Scalp Treatment with Hot Stones delivers triple results by targeting three key areas – the back, the face and the scalp, making it the ideal treatment for anyone. The treatment incorporates a back exfoliation, the use of hot stones for back massage to bring about total balance in the body, a personalised facial and a soothing scalp massage. Reset your body and mind with this unique treatment, ideal for those experiencing high level of stress or poor sleep patterns. This treatment begins with a complete body brushing and exfoliation, continuing with a facial cleanse. This is followed by the application of ESPA skin products for an indulgent body massage, to release tension and restore energy, along with a calming acupressure head massage that will leave you with a sense of inner calm. The exclusive Qi Facial combines Shiseido’s most luxurious and advanced skincare line Future Solution LX, specially developed to maximize the skin’s beauty as well as to diminish the signs of ageing. The treatment commences with the application of a specialised mask to lift and sculpt the contours of the face, especially the jawline, followed by a scalp, hand and foot massage. Ideal for men, especially those who train regularly, this one-hour long Deep Tension Relief intense massage treatment relieves muscular stress by deeply penetrating and restoring the muscle tissues. Perfect for those who want to experience the ultimate relaxing massage at ShuiQi Spa. 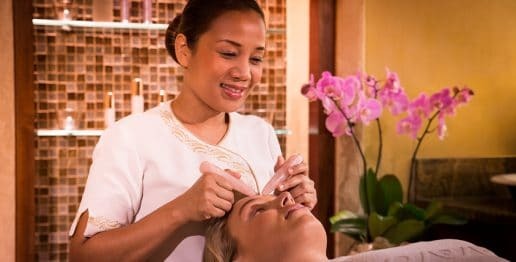 The deeply caressing massage techniques of our estheticians allow the body to relax and unwind with a sense of wellbeing and inner calm. A prescribed application of Shiseido body products for a calming Qi body massage will leave you with a sensation that brings total relaxation to you. The ultimate in manicure and pedicure luxury, ShuiQi’s Pedi:Mani:Cure Studio by Bastien Gonzalez offers an award-winning synchronised four hand treatment focusing on feet, legs, hands and arms. The much-celebrated French Podiatrist Bastien Gonzalez seamlessly combines wellbeing and beauty in his techniques in conjunction with cosmetic science to give a luxurious, novelty experience unlike any other. The perfect add on to any spa treatment and for the ultimate relaxation, try the relaxing toe to knees massage and exfoliation performed with Black Diamond Scrub, a 20-minute Relaxation Floating Experience, a ZeroBody floating experience that focuses on relieving stress and inducing complete relaxation. Curious to know more about ShuiQi Spa? Acquaint yourself with the top facts about ShuiQi Spa & Fitness before your spa visit at Atlantis. Enhance your energy levels, improve your inner balance, and indulge yourself at ShuiQi Spa and other resort facilities through Atlantis Life & Style Membership, the most elite lifestyle membership in Dubai. 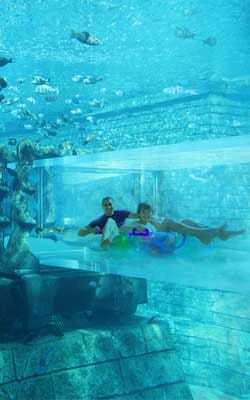 One complimentary daily session at Atlantis Kids Club. 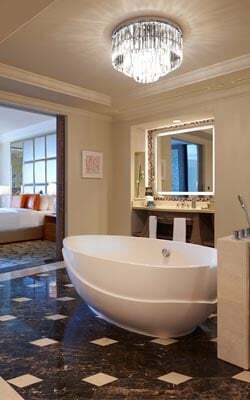 We invite you to enjoy a day of relaxation and pure indulgence in an oasis of luxury that is Atlantis, The Palm. Take a break from the everyday stresses; schedule your relaxation at ShuiQi Spa & Fitness today!